Relay conforming to EN50205 standard regarding relays "with linked contacts". No recommended operating position. Relay protected by a plastic cover. Pluggable on sockets including a locking bracket. Pins at the standard pitch of 2.54 mm. 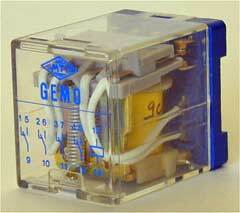 GEMO relay is pluggable on the following sockets : ER/GE, ER/GE 2.8, EVB/GE, EVC/GE 2.8 and EW/GA. GEMO relays can be polarized according to a 10 combinaison code. Number of contacts 4 inv.